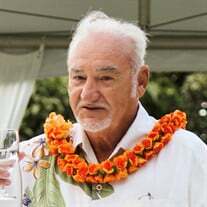 Rudy Mitsuo Hamasaki 72, of Honolulu, died on December 30, 2017. He was a lifelong hunting enthusiast and a loving father and grandfather. Ashes will be scattered at Tantalus Lookout Park on Sunday, January 7, 2018 at 11:00 am. The family of Rudy Mitsuo Hamasaki created this Life Tributes page to make it easy to share your memories. Send flowers to the Hamasaki's family.